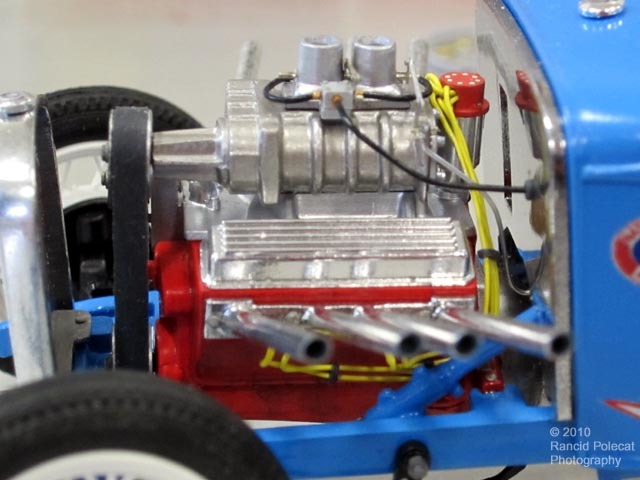 The kit's instruction sheet described this "dragster" version as powered by a Chevrolet engine with a GMC blower. Norman stayed faithful to the artwork while adding much-needed details. His foremost deviation was to replace the woefully-undersized kit-provided Hilborn 2-Port Fuel Injector Unit with a more appropriate unit from an AMT Parts Pack 392 Chrysler Engine kit. He followed photos taken in the 1960's of an actual drag racer as he detailed the engine with fuel lines, wires, and linkages. The magneto, yellow spark plug wires, fuel line, brake lines, and battery cables are all from Detail Master.